Jardin de Vies, ready to swim ? To enter Lou Penequet, you cross the south-facing courtyard, in the centre of which is a beautifully shady tree that produces the edible orange persimmon fruit in the autumn.The courtyard and terrace are the perfect place to practice the idle life, eat your meals or leave children to play safely. Enter the main room and you will find the fully equipped kitchen behind a bar and, at the end of the room, the lounge area with wood burning stove. On the right is the eating area. Taking the staircase which will lead you to the first bedroom with a double bed and the second with two single beds at floor level and a third on the mezzanine. A bathroom and independent toilet complete this accommodation. 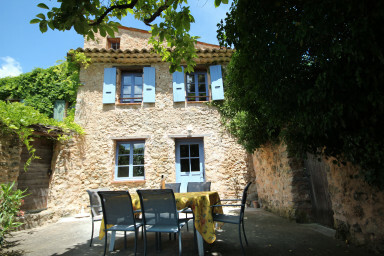 Quiet and privacy in Provence !